BRIGHTON Mich., - If you’re a parent of a young child then you know how important it is to make sure that your child is safe at all times. So then let us ask you this, is your child’s car seat secure in your Ford vehicle? Read our Car Seat Tips and learn more! In the event of an accident a properly used car seat can decrease the chance of a fatality by 71%. Car seats do expire, and most of them in only 6 years so do not continue to use them after their specified date on the back of the seat. If you have a vehicle that was manufactured after 2003 then you should use the latch system to secure the seat in your car. Your child should remain in a car seat until their legs are long enough to be able to bend their knees over the edge of the seat when sitting up straight. Otherwise children will tend to slouch and the seat belt will not cover their hips (which is where it should be) it will instead cover their stomach. Why not head on over to our Brighton Ford lot and look for a vehicle with a spacious back seat to fit your child’s car seat as well as all the essentials for a child! Or check out our Online Inventory and shop around. 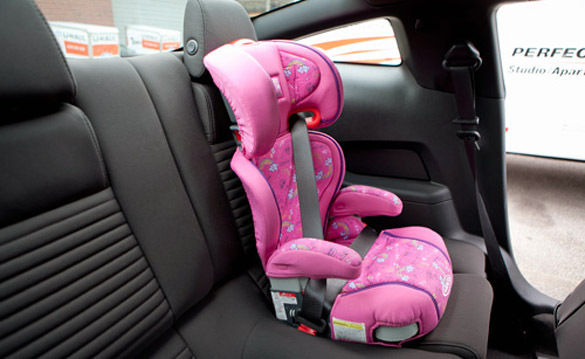 We hope that you will use our Car Seat Tips to make your child's Ford experience safer. But remember, if you're not sure exactly how to install the seat then you can always find classes in your area even if it is just a two-hour class, it will help!